Hitler's Brain is saved by Nazi madmen, and is giving orders on a small tropical island! David Baker: The human mind is strange, Marge. Even doctors can't know everything about it. 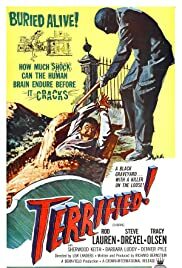 Cheap drive-in shocker about a ski masked maniac running around a small town, the adjoining ghost town and and cemetery scaring people to the extreme before killing them. Good small scale horror film is genuinely creepy with a nice feeling of tension running all through it. The film's one weakness is its sets which look very much like sets, the ghost town looks like the frontage of a western street scene at night and the cemetery is in no way realistic. If you can go with it and give the film's sets a pass the story and the performances will carry you along pleasantly to the end.